The display on the new iPad Pro includes a feature called True Tone, which uses ambient light sensors to automatically shift and change the displays color hue and intensity according to the surrounding light, shifting from cooler to warmer as the surrounding lighting environment changes. It’s kind of like a smarter real-time adapting version of Flux for Mac or Night Shift for iPhone, and it’s definitely a great feature on the iPad Pro for users who take the device into different lighting conditions on a regular basis. It’s a handy enough display feature that it’s likely coming to upcoming iPhones and Macs as well, but for now it’s baked into the latest iPad Pro only. Perhaps the only problem with the True Tone Display is if you’re trying to perform color accurate work, since the on screen color will look different to you as the display shifts it’s hue. Accordingly, designers, artists, and even this who just like to sketch for fun, may want to toggle the True Tone color display off or on as needed. 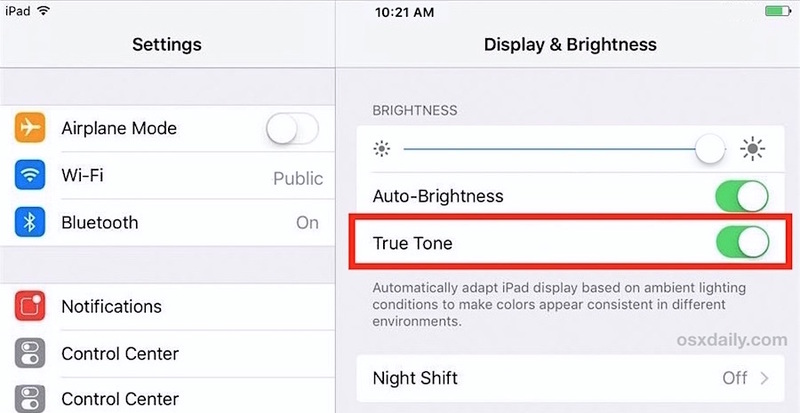 Assuming True Tone is actively adjusting the color of the display, the effect is instantaneous when you turn the feature off or on, and you will almost certainly notice the screen color shift to be warmer (sepias) or cooler (blues) on the iPad. For most users it’s a good idea to leave their iPad True Tone display enabled, it is the default setting for the feature for a reason, since it undoubtedly improves the screen reading experience, and there is plenty of research out there about the effects of blue light which are less than flattering. Nonetheless, for artists, designers, and even just those who like to draw or sketch in Notes will likely find the toggle switching a handy feature to flip True Tone on and off as their use case requires. 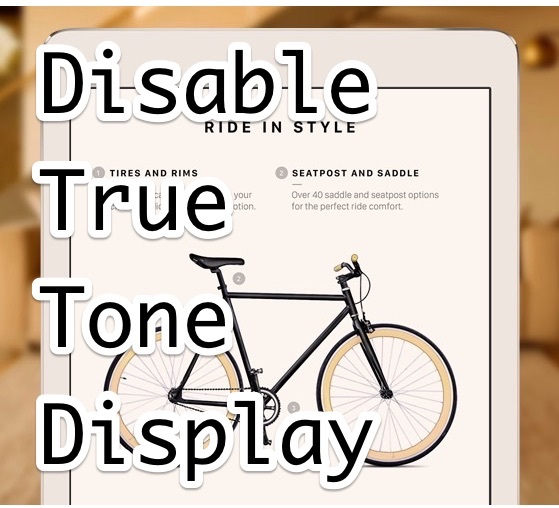 True Tone is a great feature, at the moment it’s available on the iPad Pro 9.7″ display model but it’s undoubtedly coming to the larger 12″ version, and as we mentioned before, it’s probably going to show up on the iPhone Plus, and it wouldn’t be totally crazy to see a similar color shifting display feature arrive on future MacBook Pro models as well. In the meantime, other iPad and iPhone users can enable Night Shift in iOS (better yet, schedule Night Shift to turn on automatically) for a similar albeit different color shifting experience and make their screen display look warmer. My 12″ iPP has no such feature. You could have saved a lot of reading, setting, looking and overall WASTED TIME by indicating WHICH iPad Pro has the feature IN THE FIRST SENTENCE. “New” doesn’t cover it, does it? In order to get to the comments section, you have to pass through that exact sentence. Amazingly enough John, my Windows 95 PC doesn’t include the feature either! Amazing how old hardware doesn’t include new features, the outrage that must ensue! John, I hate to disappoint you, but you do not drive a Tesla, you don’t have a 2016 Tesla Model S! How upset are you about that? Unbelievable! You should complain to your car manufacturer! As an owner of a 12.9″ (not 12″) iPad Pro, you should have known that your iPad Pro does not have this feature. I familiarize myself with the specifications and features of everything that I buy before I buy it. I have a 1 month old iPad Pro and it does not have this feature?? John – you must be very slow, and pathetic. The time it takes to read this article and inspect settings is maybe 2 minutes of your life. WASTED. Wow! Serious first world problems, dude. I guess you just need something to complain about. You should spend some time in Bangladesh or Siberia or Allepo. I guarantee you when you return you’ll be thrilled to be able to read a blog and enjoy 2 minutes farting around with your $1000 toy. I applaud the authors who take their time to provide this content. Incidentally, it took you longer to write this comment than it took you to read the article and WASTE your time.